Early November this year I had a great honour to organise and conduct with my husband Atma Kriya Yoga course along with Sri Yantra Painting Meditation course at the feet of the Himalayas, close to the cave of Mahavatar Babaji himself, Paramguru of our lineage, who gave Atma Kriya Yoga to the world. 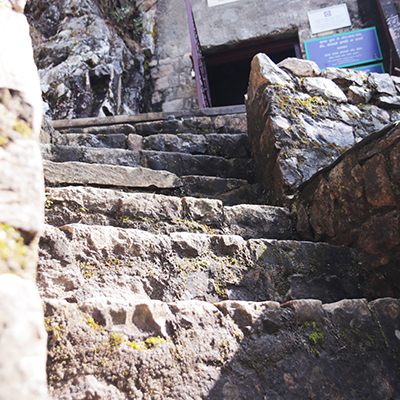 In fact, the very place in Himalayas, where we had the retreat, is like a birth place of kriya yoga – as in this very cave Mahavatar Babaji gave kriya yoga for the first time for the wide audience through Lahiri Mahashaya (you can read more about it in “Autobiography of a yogi”). Deep in my heart, I had the desire to visit this place since some time. But the idea to organise the entire Atma Kriya Yoga retreat for Indian audience, in a foreign country, was completely spontaneous. From the very beginning it felt like a completely guided process, and we could feel Gurudev’s grace guiding us on each and every step. As we announced the retreat really last minute, we didn’t have any big expectations about the number of participants – in fact, no expectations at all. 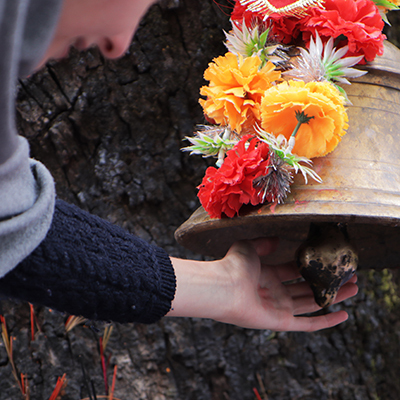 We were determined to visit this sacred place, even if that would be just the two of us. But what is so special about this place, you may ask? Well, first of all, it is here, where Mahavatar Babaji, father of kriya yoga, gave it for the first time to the world at large. His cave, which you can visit here, is where Babaji gave kriya yoga for the first time to Lahiri Mahashaya, and then through him, it was spread to the world. And for us, kriya yogis, who know the value of Atma Kriya Yoga, that is not a small thing. You can still feel very high vibrations in this place. 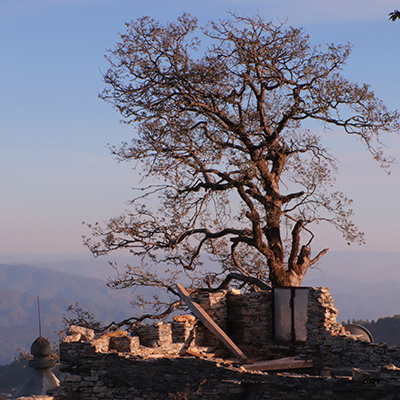 Not very far away from this special cave, there is also a special tree, under which Mahavatar Babaji and Lahiri Mahashaya would sit and meditate together. The mountain, where the cave is located, is called Dunagiri – and there are many sacred places here, which make it so special. 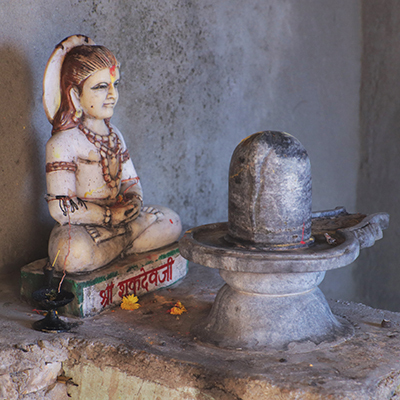 One of the most ancient shaktipeethas or places of power of Divine Mother is located here, few meters from the tree of Mahavatar Babaji. This very mountain, Dunagiri, is also the one, which Lord Hanuman was carrying in his hand across India to Lanka to save Lakshman, brother of Rama, from death – as even in those ancient times Dunagiri was known to be abudant with healing herbs, which can still be found here. Pandavas stayed here during their exile, too. 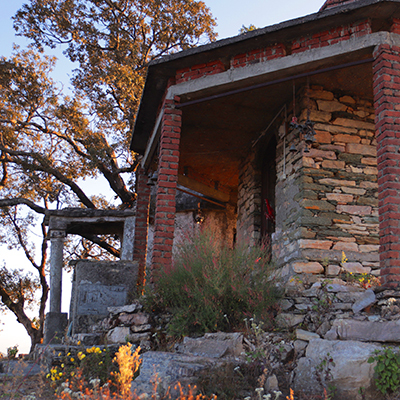 Their house was located just a little bit above the cave of Mahavatar Babaji. Not very far from there is also a small temple of Sukhadevi, which is literally a birthplace of India – as king Bharat was born there. And, we thought, a place, which is so rich with sacred places, must be truly special. So we followed our heart’s call. And I am so grateful that we did – because this was probably one of our most beautiful adventures ever. 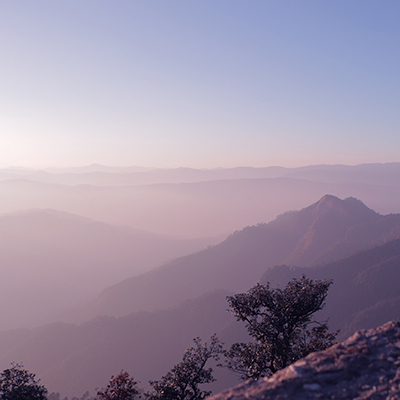 As Dunagiri is 2,5 km high, the journey itself was a bit challenging – especially, because the two of us, unlike the participants of the retreat, needed to do it in one go, from London to Dunagiri, without stopping over night in Delhi. It took us 30 hours in total. I must admit, that I was quite afraid of this long journey (especially because the last part of it needed to be done by car), as I had quite severe spine issues this year. 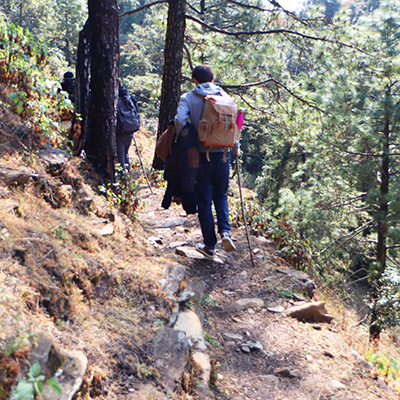 Normally, with my health condition, severe pain in the spine would be guaranteed after such long journey. But this is where I experienced the first, unexpected miracle: during the entire 30 hours long journey I didn’t felt any, even slightest discomfort in my spine. I knew straight away that this is the grace of our masters protecting us – and it touched me deeply. But when we finally arrived at Dunagiri, we knew straight away that every hour spent during the long journey to get there, was worth it. This is probably one of the most beautiful places I have ever visited in this lifetime. 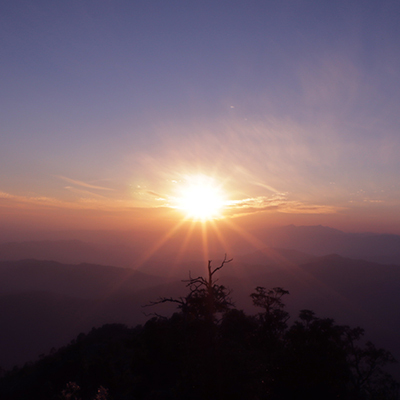 Placed in the secluded area in the sacred Himalayas, surrounded by pristine nature, which is so generous there, and wrapped in complete silence… This is what Dunagiri is like. Water is there so clean that you can drink directly from the river. 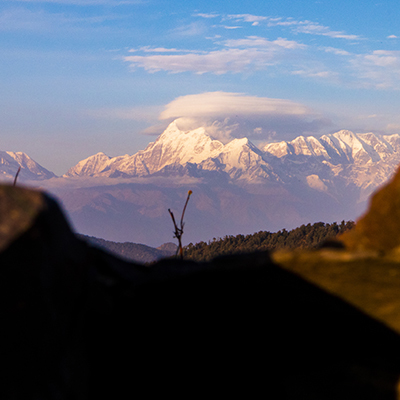 And just to wake up every morning, seeing from your window Sun rising above the sacred Himalayas, breathing in the fresh air while doing your pranayamas, and having a view from your room’s window directly at Babaji’s cave… This is not something you can describe in words. This is something that you can only experience. It was literally like a kriya yogi’s dream come true. To teach or to learn Atma Kriya Yoga itself there, along with the science of painting Sri Yantra and meditating with Sri Yantra, is not only a great blessing, but also deeply purifying experience. 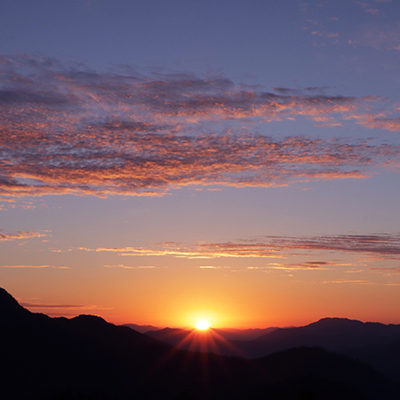 Even though many people planned to come to this retreat, and even paid for their flights and participation, only few could reach there in the end. I felt so humbled and blessed to be able to share with others gift of Atma Kriya Yoga so close to the cave of Mahavatar Babaji himself. His presence there with all of us was almost tangible. We were even so lucky, that when we arrived at Babaji’s cave on the last day of the retreat, there were no pilgrims at that time, which gave us the opportunity to do Atma Kriya Yoga initiation for new kriya yogis right in the cave of Mahavatar Babaji himself – where he gave kriya yoga for the first time. 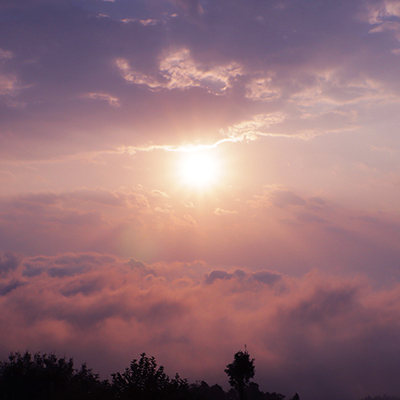 I don’t know how it felt for the newly initiated kriya yogis – but for me, personally, it was otherworldy experience. 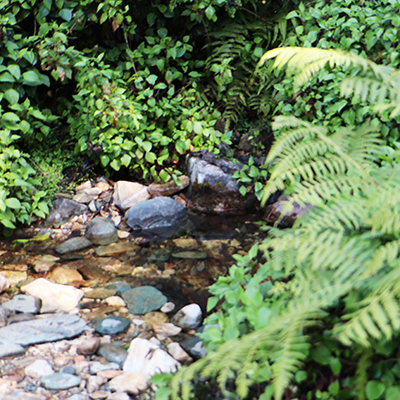 The cave itself is located in a truly beautiful, secluded place at Dunagiri mountain, surrounded by the murmuring of water streams flowing there and abundance of healing herbs. 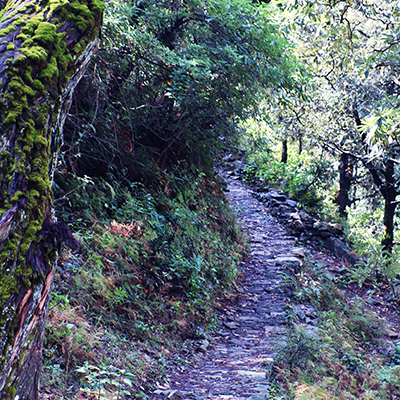 The path to the cave itself has a very special charm and is pervaded with deep sense of peace. Pictures do very little justice to its beauty. 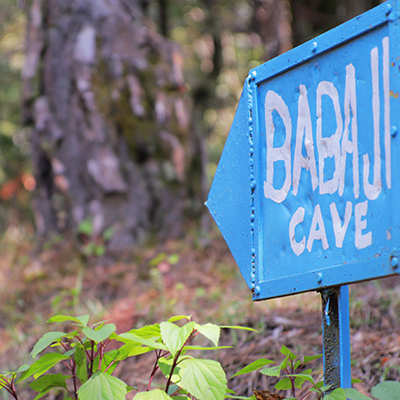 But this, what you feel, when you approach this cave, where Babaji himself was dwelling, cannot be put in any words. 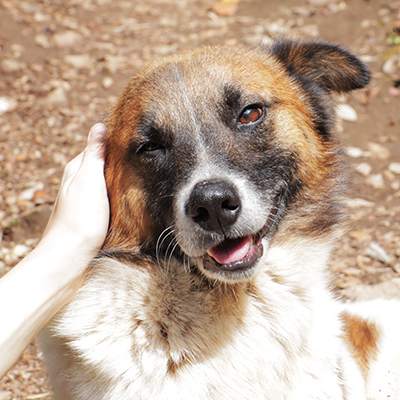 You can see below also the picture of a very special dog. Pilgrims visiting Mahavatar Babaji’s cave frequently, told us that this dog often accompanies pilgrims to Babaji’s cave, then stays there for a while, and when the pilgrims are finished with their meditation, he accompanies them all the way back. It made me think: God comes in so many forms! But not always do we have “the eyes to see”. 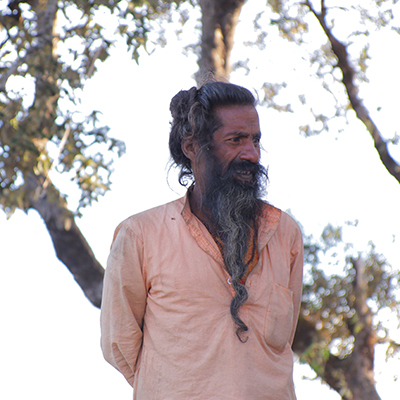 At this sacred place we have also met a sadhu, who has dedicated his life to this temple. 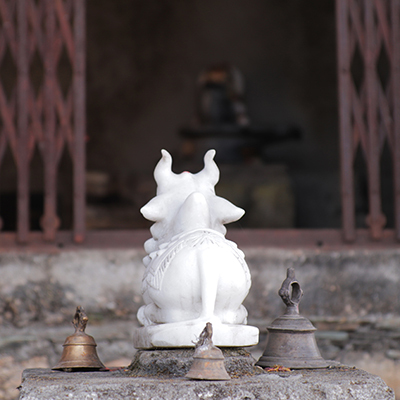 He has told us about the rich history of this temple. But just to see his simplicity and deep inner peace reflected on his face, was so deeply inspiring. He lives there completely alone and in completely secluded place in the Himalayas, where barely any pilgrims are ever coming. The only things he posses are few dhotis and two cows, out of which only one is giving him 1,5 litre of milk twice a day. When we asked him, how does he manage to live like that or what does he do if, let’s say, his cow will not give him milk on some day? He just replied: “God will take care”. Yet, if you look at deep peace and satisfaction that he is radiating, he looked like the richest man in the world. It really makes you think about what is the true wealth in this world – and it has so little to do with material things or money that we have. For me, personally, it was a very humbling experience. Often we think very highly of ourselves, just because we are on the spiritual path or do a little bit of meditation. But how many of us have this deep inner peace reflected on our faces? How many of us would be ever able to live in such harsh conditions, yet with such deep trust in God and inner contentment? To talk about it is one thing, but to meet such a holy man in person, really makes you think about yourself – and makes you question, how serious we truly are about our spiritual path. It was for me a very special experience. But the place that really touched me the most was Ma Dunagiri shaktipeetha – one of the most ancient sacred places of power. Divine Mother is worshipped there in a formless form – there is no deity in the temple. She is worshipped there as all-pervading ether, formless liberating power and cosmic sound itself. 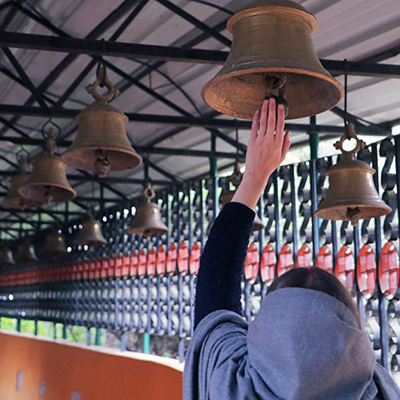 This is why the entire way to the shaktipeetha, leading through 360 steps, is filled with bells. 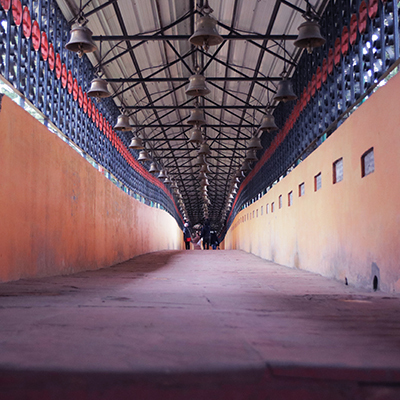 Pilgrims approaching this place usually do it in complete silence, broken only by the ringing of the bells – one bell rang traditionally with every step you make. 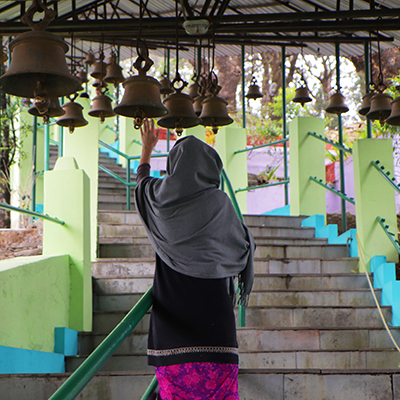 Going up, step by step, to the sacred place of power of Divine Mother, who blesses Her devotees with liberation, and ringing the bell on every step, was an underworldly experience. On the last part of the way to the temple I was a little worried, as it needed to be done without shoes – and it was really cold and wet on that day, right after rain. As I had a kindey inflammation, I was a bit worried that it will make my state worse. But Divine Mother took care of everything. Not only it didn’t have any negative impact on my health, but, suprisingly, I couldn’t feel any discomfort while walking. Not only I didn’t felt any sense of coldness, but even some strange warmness spreading in my body from within. For me, personally, this was a true miracle. Divine Mother’s secret presence is almost tangible in this place and fills your heart with some unexplainable joy – and to feel Her love and care in such tangible way is a truly touching experience. 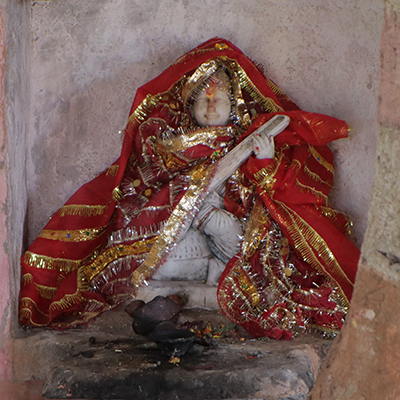 No wonder that this sacred shaktipeetha was also chosen in the past by Mahavatar Babaji as his meditation place. Local people believe, that Mahavatar Babaji was doing his tapasya here, as well as he was meditating here with Lahiri Mahashaya. 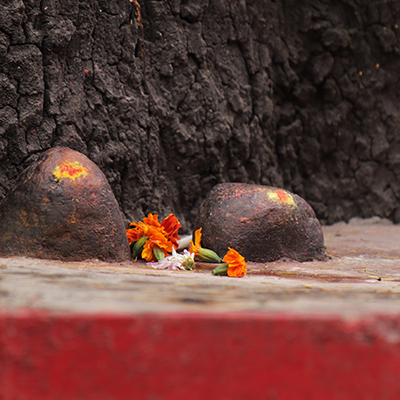 Few meters from shaktipeetha the sacred tree under which he would meditate can be found, with two stones at its feet – representing Mahavatar Babaji and Lahiri Mahashaya. There are no words to express, how deeply grateful we both are, that with Babaji’s and Guru’s grace we were able to visit this special place, and – even more – to share the gift of Atma Kriya Yoga and Sri Yantra there with new kriya yogis. But one thing is sure: we will definitely do it again. 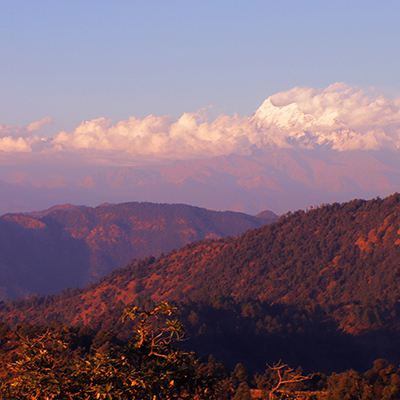 Dunagiri is such a place, which your heart yearns to visit over and over again. And, who knows, maybe next time you will join us, as well?